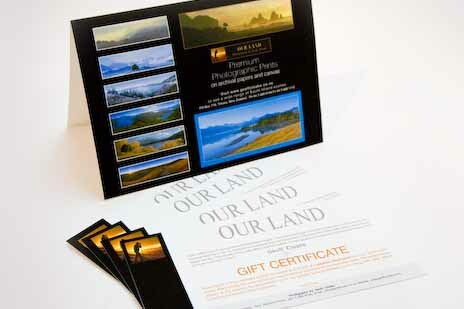 Buy gift vouchers for your friends, family and workmates. Geoffs photos make exceptionally good value presents for birthdays, weddings, andfarewell. so they can choose a photo from my COLLECTIONS or OUR LAND Series and have it delivered to them. We will confirm prices by return Email and advise payment methods. All prints are set within white or coloured borders which can substitute for a decorative matt. An additional 7mm margin is provided for the frame rebate. Subtle titling and the Geoff's digital signature are placed within the bottom border. Series information including reference number, copyright and contact details is included in the bottom margin so as not to be visible after framing. All has been carefully designed to enhance the presentation of the images, so framing to show this border is recommended. Geoff supplies his fade resistant prints with acid free materials, framed or unframed along with a hand signed certificate of authenticity with serial number and his photographer's label for the rear. To ensure best rendering and archival qualities each print is made from very high quality digital files which as from 1 June 2003, are printed on Kodak Endura photographic paper by the Kodak LEDII process. If displayed in normal room conditions, this type of print will hold its colour for many decades. A giclee alternative to photo prints is ink on paper prints made by Geoff on his Epson 2100 or on commercial wide formal printers. Unframed prints are usually supplied lose on acid free foam backing board, packed in conservation pouches. Medium sized prints can also be supplied hinge fastened under acid free matts. Super large prints are normally rolled and tubed for shipping, but can also be supplied under matts and mounted on acid free foam board ready for framing. Laminated onto 3mm acrylic sheet with a protective overlaminate, framed prints don't require glazing, improving viewing, making them lighter and far more durable - ideal for gifts and distance shipping. To ensure longest possible life it is recommend each print be conservation framed behind glass. If you wish your print to be 'collectable' and achieve its highest value, permanent coatings, laminating and/or permanent mounting on backing board are not recommended. 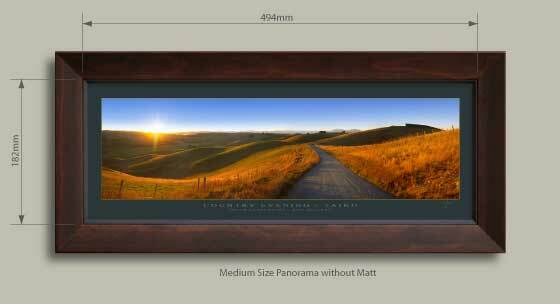 All prints can be supplied in the photographers standard framing - genuine NZ Pine with traditional dark timber or contemporary black finishes. Super large prints can also be framed in a more premium range of frame designs. The optimum conservational method of framing is to use an acid free matt to space the the print away from the glass. If a more compact frame is desired, invisible acrylic spacers can be fitted as an alternative to the matt. Because of the tough resin surface of the Kodak Endura, prints can be more economically framed as a simple sandwich between backing board and glass. With proper packaging, glazed frames should easily survive shipping. To reduce any risk of breakage, however, it is recommended larger frames be supplied without glazing for long distance shipping. Your local framer can easily complete the glazing. Premium OUR LAND COLLECTION prints are now available as sets in off-white framing with archival double matting for NZ$600 each (incl GST). 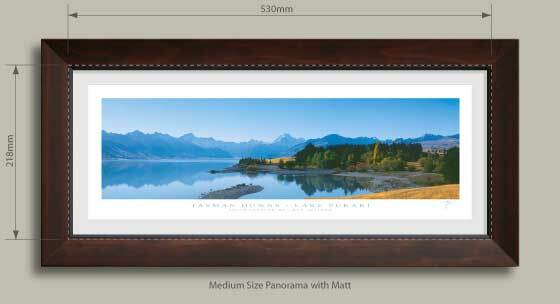 Prints can also be supplied unframed in conservation pouches for NZ$295 each Incl GST). Geoff's OUR LAND series and other selected fine art prints are available in the following sizes: Reversible mounting is recommended. See below for printing, framing and conservation pouch options.